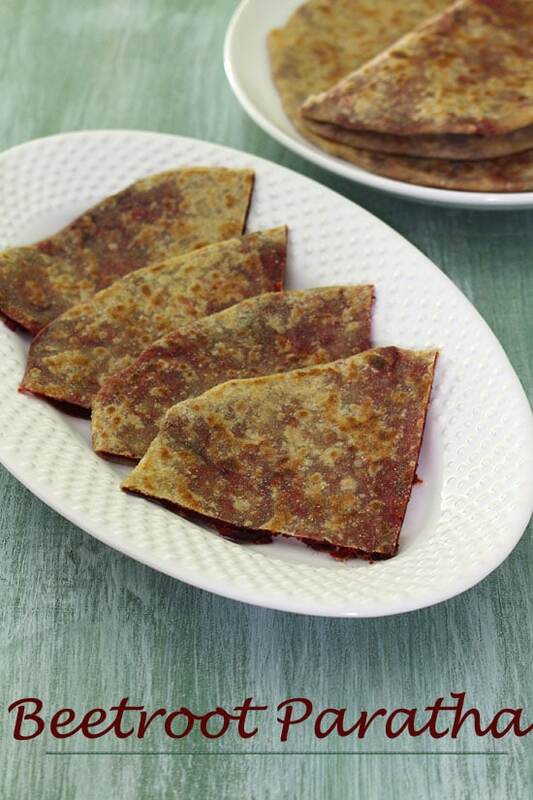 Beetroot Paratha Recipe – This is the stuffed version where stuffing mixture is made from grated beetroot, boiled, mashed potatoes and some spices. 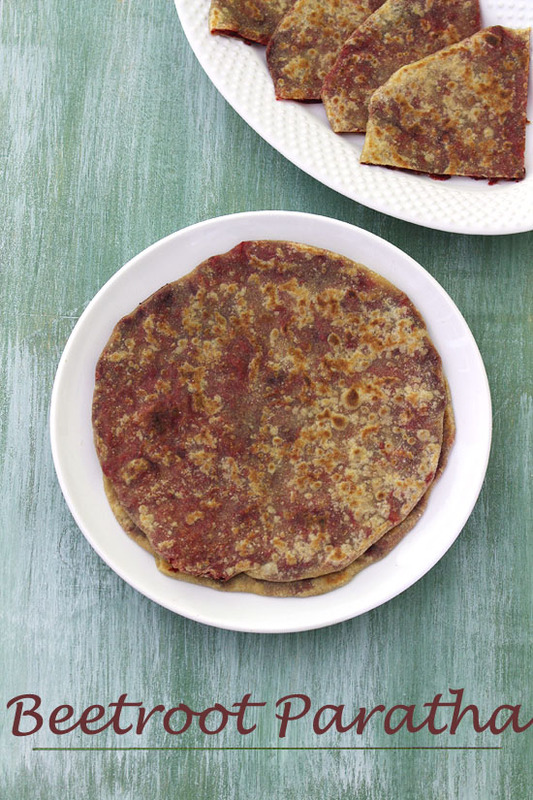 There is another version of making beetroot paratha where raw finely grated or boiled, pureed beetroot is added directly into the flour to make the dough. This type has less taste of beetroot vs stuffed version. Beetroot has many health benefits so we do include in our diet by making beetroot raita, beetroot rice, beetroot roti or this paratha. and many times, we eat it raw as a salad. We also like to enjoy beetroot leaves in dal and sabzi. As you know that beetroot has slight sweetness to it. So to mellow down the sweet taste I have added some boiled potatoes. Also the addition of amchur powder balances the sweet and sour taste in the stuffing. 1) First start by making stuffing mixture. For that heat the oil in a pan on medium heat. Once hot add cumin seeds and let them sizzle. 2) Then add ginger paste and green chili. Saute for 30-40 seconds or till the raw smell of ginger goes away. 3) Now add grated beetroot. 4) Also sprinkle salt and mix well. 5) Cook till it is soft and there is no moisture left. It took me around 6-7 minutes. Do stir in between. 6) Now add mashed potatoes and roughly mix. 7) Then add red chili powder, coriander powder, garam masala and amchur powder. 8) Mix everything very well and cook for 1-2 minutes. Then turn off the stove and let the mixture cool down. 9) Meantime let’s make the dough. For that take atta and salt in a bowl, mix. 10) Drizzle oil in it. 11) Using fingertips mix the oil into flour thoroughly. 12) Now start adding little water at a time and keep kneading the dough. Make smooth and soft dough. Cover it and let it rest for 15 minutes. 13) Now the stuffing is cooled down. Divide it into 10 equal portions and make balls. 14) After the resting time, knead the dough once again to smooth out. Then divide it into 10 equal portions as well. Make smooth balls and flatten between your palm to make disc. 15) Work with one disc at a time, dip both sides into dry flour. 16) And roll into 4 inch diameter circle. 17) Put one stuffing ball in the center. 18) Gather the edges and pinch to seal it. 19) Now using your fingers flatten it gently and make around 3 inch flat disc. 20) Now dip this into flour and using rolling pin roll into 6-7 inch diameter round circle. If it is sticking to the board then sprinkle little dry flour on it as needed. 21) Once you have few parathas ready, heat the tawa or pan on medium heat. Once hot place the rolled paratha and cook for few seconds. 22) When you notice the bubbles on top, flip it and cook other side for few seconds. Meantime drizzle oil on the top surface. 23) Flip and press lightly using spatula, if rolled properly it will puff up. Cook till bottom part has few brown spots and no more raw doughy part appear. 24) Now apply oil on top side and flip again. 25) Similarly cook other side by pressing with spatula. 26) When you see the other side also has brown spots, that time paratha is ready and remove it from the tawa and serve right away or keep in insulated container. Repeat the same for rest. Serving suggestion: Serve beetroot paratha as a breakfast or dinner meal with bowl of plain yogurt or raita (onion tomato raita, onion raita, cucumber raita) or pickle. This can be packed into kids or adult’s lunchbox. Heat the oil in a pan on medium heat. Once hot add cumin seeds and let them sizzle. Now saute in ginger paste and green chilies for 30-40 seconds. Add grated beetroot and salt. Mix and cook till beetroot is soft and no more moisture left. Add mashed potatoes and all the spices (red chili powder, coriander powder, amchur and garam masala). Mix and cook for 2 minutes. Then turn off the stove and let the mixture cool down. Mix in chapati atta and salt in a bowl. Add oil and mix using fingertips. Start adding little water at a time and keep kneading till you get soft and smooth dough. Cover it and let it rest for 15 minutes. Divide the stuffing mixture into 10 equal portions and knead the once again after resting period and divide into 10 equal portions. Take one dough ball and dip into dry flours. Roll into 4 inch diameter circle. Place one stuffing portion in the center and gather edges, seal it, press lightly using fingers to make disc. Dip again into dry flour and roll into 6-7 inch diameter circle. Heat the tawa on medium heat. Once hot place the paratha. Dry the paratha by applying oil on both sides and by pressing with spatula. Once you see brown spots on both sides, remove it from tawa and keep in insulated container. Repeat the same procedure for rest of the paratha. wow this looks quite easy and delicious,i would really love to try this. woujld also love to try Potato paratha if you could,please do send it too. I have stopped email subscription, so I am not able to send it to your email. You can print the recipe.